At the confluence of being chronic meme aficionados, internet research scholars, and educators to cohorts of young people, in 2017 my colleague Kristine Ask and I began a project to consider seriously the types of memes students share online. Memes have been established as objects that bear meaning beyond mere internet frivolity. Studies in vernacular cultures have framed memes as “the propagation of content items such as jokes, rumours, videos, or websites from one person to others“, and as a form of “pop polyvocality” or “a pop cultural tongue that facilitate[s] the diverse engagement of many voices“. Other studies from media and communications have found that memes are a “shared social phenomenon“, and still others from the socio-cultural perspective have asserted them as a “common instrument for establishing normativity“. 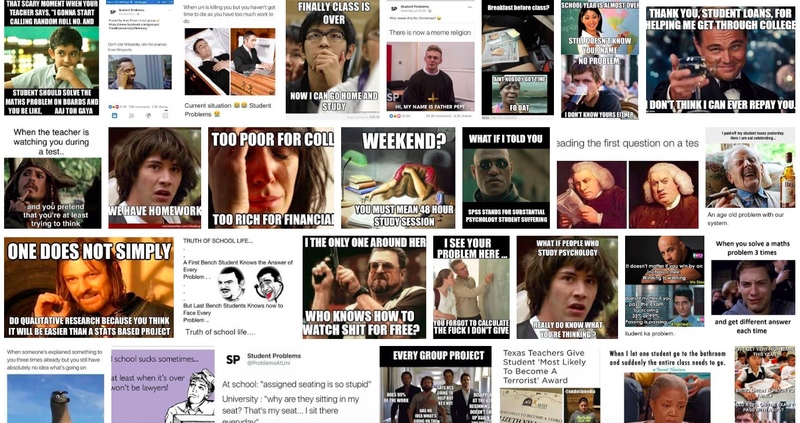 Specifically, we studied the popular Facebook page “Student Problems” on which over 7 million subscribers participate in producing, circulating, gatekeeping, and consuming memes focused on mental health issues, student debt, racism, sexism, and other struggles associated with student life. Aside from the humour proliferate on the Facebook page, the Student Problem brand’s flagship website also dishes out tips via (moderately sincere) Student Guides and an online shop of blatantly self-ironic merchandise, such as a “Cry Cushion” with the inscription “place head and cry”. Evidently, self-deprecating relatability is the order of the day, in which condescending, pessimistic, and vulnerable displays of student struggles have arisen in opposition to the rise of pristine, prestigious, and celebratory content propagated by social media Influencers and everyday humblebraggers. As vehicles of emotive visual display, Student Problem memes allowed users to build a sense of community, camaraderie, and commiseration, albeit clouded in the language of humour and wit. Although our study also considered findings from a workshop with undergraduate students in two batches, and a media watch of press coverage on student issues over several months across the world, in this post we focus on the content analysis of just the Facebook page and briefly discuss three themes from our sample of 179 memes collected between March and May 2017. Student Problem memes characterise the average student as one who is overwhelmed, stressed, and ashamed. In these narratives, the primary directive is to display and highlight one’s agony to solicit acknowledgement and publicity rather than to seek practical solutions. This is especially because the tone of the memes frame student problems as ubiquitous, impossible to change, and an inescapable experience of student life, to the extent that the only option is to endure the agony. This pain spills over to outside of the classroom, impacting the quality of a young person’s life in general, and their ability to juggle other responsibilities such as their part-time jobs, family duties, and friendship circles. As a placeholder for the non-student aspects of a young person’s life, the memes often reference a leisurely pursuit – such as watching Netflix – as so guilt-ridden a recreational aspiration that students no longer have the allowance to enjoy downtime without being overwhelmed by the omnipresence of stress and anxiety. Yet, alongside this perpetual undercurrent of stress, students also feel that their suffering is to be confined to self-management or silence, out of fear of shaming oneself in front of fellow peers, authoritative educators, or oblivious family members. As such, despite the structural and institutional nature of student problems, students generally internalize their pain as individual battles. Apart from communicating student pain, the overtone of successful student problem memes that register high circulation and reaction from users tend to convey self-deprecating humour. Meme producers use self-deprecating humour to craft a flexible repertoire of potential interpretations to amplify their meme’s resonance with a potential audience. For the more casual users who may only glean the surface of a meme for humour – unaware of the subtext and code-switching in which structural and generational problems of student life are embedded – student problem memes may come across as mere humour. But for users who are “in the know” and able to identify more deeply with a meme’s interpretive depth, collective effervescence from laughing-and-crying together allows for depressed students to share in a networked collective identity through self-selection and declaration into the “in group”. Further, self-deprecating humour is usually employed in tandem with the rhetorical device of exaggeration as silliness, enabling students to comment on the severity of their problems from a more emotionally-distant and consequentially-safe space. As such, while Student Problem memes are keyed in emotional tones of humour and entertaining irony, they also solicit empathy as a statement of commiseration. Finally, between the self-exposed vulnerability of student struggles and the self-celebratory irony of competitive memeing, students demonstrate a meta-commentary of powerlessness and loss-of-control by using internet media and lexicon to communicate that memes are all they have to convey and cope with their pain. Student Problem memes tend to highlight a semblance of self-awareness that procrastination is a casual root and also a subsequent amplifier of student problems. The narrative structure of these memes describe a gradual decent from safe leisure to feared future, in which students identify relatable moments of delaying work, proceeding to feelings of helplessness as procrastination extends, culminating in insurmountable consequences from prolonged procrastination that has grown too overwhelming to repair. Yet, these initial roots of procrastination are fuelled by deep-seeded feelings of guilt and shame or structural problems such as poverty and discrimination, all of which cannot be easily or swiftly addressed. In the vein of internalizing self-blame, students then condition themselves to identify all non-study time as procrastination, even if these were necessary downtimes for recuperation or recreation. As such, Student Problem memes are regarded as an illusionary if transient safe haven from the realities of student life, in which cyclical struggles are refocused as humorous helplessness and ironic celebrations of a life out-of-control. To learn more about our findings on how Student Problem memes are an important communicative vehicle, read our journal article “My life is a mess: Self-deprecating relatability and collective identities in the memification of student issues” in full from Information, Communication & Society here. Dr Crystal Abidin is a socio-cultural anthropologist of vernacular internet cultures, particularly young people’s relationships with internet celebrity, self-curation, and vulnerability. Her forthcoming book, Internet Celebrity: Understanding Fame Online (Emerald Publishing, 2018) critically analyses the contemporary histories and impacts of internet-native celebrity today. Reach her at wishcrys.com or @wishcrys.